Whether you are a skiing, cruising or fishing enthusiast Bakers Basin Marina offers the best of all nautical worlds. Bakers Basin Marina is located on the protected South Harbor Lagoon in Waretown, NJ. The boating marina has direct access to the Barnegat Bay and the intracoastal waterway. Located across the bay from the Barnegat Inlet, it is less than a 15 minute boat ride from the Atlantic Ocean. Bakers Basin Marina offers over 120 slips for boats up to 50 feet. With direct parking behind most boat slips, Bakers Basin Marina offers convenient, quiet and uninterrupted use of your boat slip. After joining Bakers Basin Marina , you will want to take advantage of the deep sea fishing by passing thru Barnegat Inlet out to the Atlantic Ocean. There are also many exciting back bay fishing trips for inshore Fluke, Blues, Striped Bass and Weakfish. The Bay is well known for hardshell clams and a large abundance of Blue Claw crabs. Returning to the the Marina you will find many fine restaurants to choose from. We have listed within our website many nearby attractions ranging from hiking, camping, sightseeing and golf, to gambling and shows in Atlantic City. Some people come down to the Marina after work just to sit on their boat, have a cold drink and watch the day fade away. 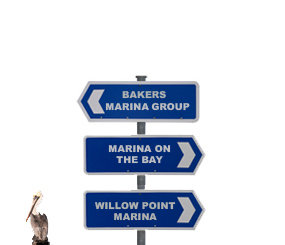 When you are a slip holder at any of our Marinas you have the opportunity of using all of our other boating marinas.